Hanoi (VNA) – Leaders of the Ho Chi Minh Communist Youth Union (HCMCYU) and the Young Communist League of Cuba (UJC) have pledged to work harder to tighten the loyal and pure relations between Vietnam and Cuba. 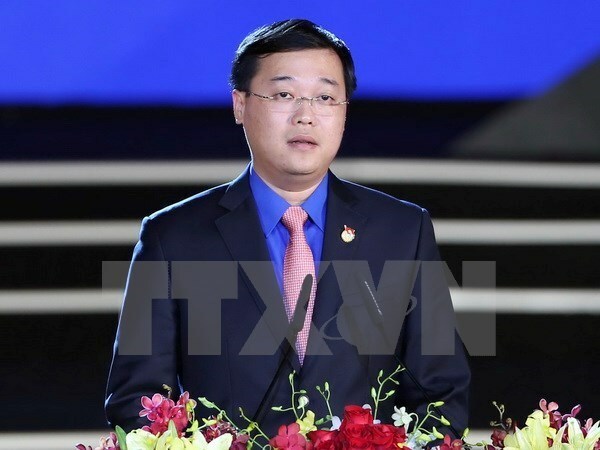 Alternate member of the Party Central Committee and HCMCYU First Secretary Le Quoc Phong, who is in Cuba from August 11-15, expressed his pride of visiting Cuba on the occasion of the 91st birth anniversary of Leader Fidel Castro. Meanwhile, Susely Morfa González, First Secretary of the UJC National Committee, expressed her belief that Vietnamese and Cuban youths would continue standing side by side together to fight for a better world. During talks, both sides reaffirmed determination to educate young generations on the achievements that the two peoples have reaped. On the occasion, the host presented the insignia of the UJC’s 55th founding anniversary to the HCMCYU representative. Phong, for his part, also presented a rice painting depicting the two communist youth forces, 100 canvases and 1,000 hammocks to the UJC.